Russian rabbi; born at Sloboda, a suburb of Bauske, Courland, 1758; died at Bauske 1830; a descendant on his mother's side of Mordecai Jaffe, author of the "Lebushim." He was rabbi at Bauske from 1800 to 1830, and wrote: "Gedullat Mordekai," responsa, and "Parashat Mordekai," sermons, published by his grandson Rabbi Bär Rabbiner together with his own responsa and those of his father, Benjamin Salkind Rabbiner (b. at Bauske 1852), for many years president of the yeshibah at Dünaburg (Dvinsk) and since 1891 a rabbi in New York, U. S. A. Ẓemaḥ Rabbiner (b. at Bauske 1862), a brother of Benjamin Salkind, studied at Dorpat and Berlin, from which latter place he graduated with the degree of doctor of philosophy. 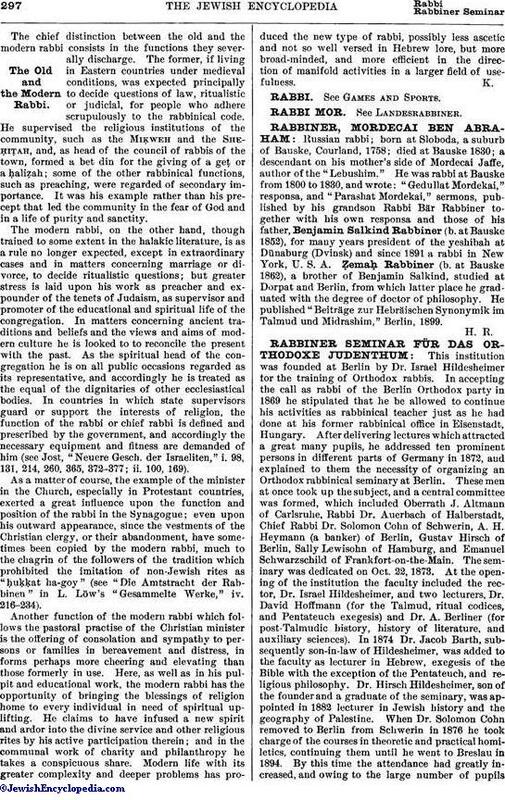 He published "Beiträge zur Hebräischen Synonymik im Talmud und Midrashim," Berlin, 1899.